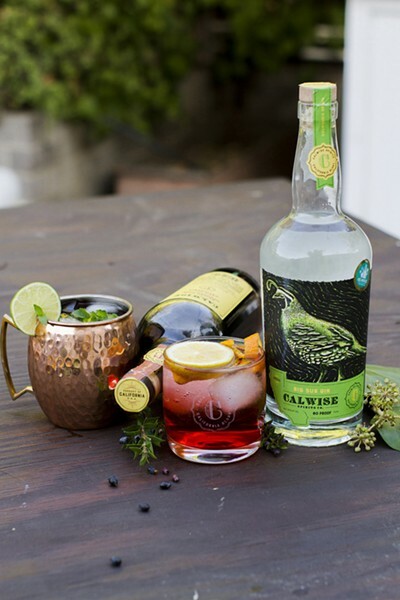 Head to Calwise Distillery at 3440 Ramada Drive, suite B, in Paso Robles Thursday through Saturday from 4 to 9 p.m. and Sunday from noon to 6 p.m. Calwise Spirits will host an event with DD Cattle Company on July 21 featuring locally raised meats prepared with Calwise's gin botanicals. For more information, call (805) 369-2662 or go to calwisespirits.com. With a dozen herbs—juniper, sage, yerba santa, fennel, and elderberry—Calwise Spirits Big Sur Gin smells like your favorite Central Coast hiking trail. LIQUID CALI From left to right, Calwise Spirits blonde rum, spiced rum, and Big Sur gin. Step inside the distillery's new headquarters—located at 3440 Ramada Drive in Paso Robles—and you'll see a living wall flush with foliage you might find thriving along the craggy coast of Big Sur. "We wanted it to have a Big Sur-meets-industrial-space type feel," Bergh says, adding that all of the bars are made from California redwood. That gin? It's made with premium wine grapes, all the rage in SLO County. Calwise's earthy spiced rum is emblazoned with the image of a Golden State Grizzly; the contents described in the tasting notes: "like a car ride through coastal orange groves farmed by naked hippies who don't believe in deodorant and wear clove, cinnamon, and vanilla essential oils instead." The blonde rum, fermented from U.S.-grown raw sugar cane and rested in chardonnay barrels, is distinctly sunny—some might even say crisp, like a breezy day at Montaña de Oro. It's just all so California. Owner and master distiller Aaron Bergh, 25, has always been in love with this place. His new cave, it seems, is his greatest love letter to the Golden State yet. With a laid back feel, massive windows, and lots of grub on hand (a slew of flatbread pizza options, bacon-wrapped dates, flourless chocolate cake), this is the kind of place you could stop into for a date night or before hitting the drum circle after a sweet surf sesh. However, let's be clear. This is not the distillery of the cigar-smoking fedora-wearing set. A DREAM, DISTILLED Calwise Distillery Master Distiller Aaron Bergh opened a new, 6,000-square-foot distillery and tasting room in Paso Robles. "People can be intimidated to taste liquor; they're worried they'll make a face or something," Bergh says. "That's why it's so great that we're able to offer cocktails to our guests, like a real daiquiri, which you have to try. You can come in, relax, have a bite to eat, and sip on a drink." That's right, folks. We're talking about real cocktails made from a full bar, not just straight tastings (which are available, too). Thanks to a new law that allows distilleries with food-serving kitchens to serve mixed drinks, Calwise is one part distillery and tasting room, one part Cali-inspired cocktail lounge. There's even a real-life bar tender (fully bearded, for authenticity). Bar manager Scott Romaine is shaking up fresh, modern drinks imbued with just-squeezed juices, muddled native herbs, and—of course—Calwise gin, blonde rum, and spiced rum. Try the Wise Man, Calwise blonde rum, broiled lemon, and blueberry sage gastrique; the Fizzy Lifting, Calwise Big Sur gin, rhubarb, Meyer lemon, and soda; or the popular California Mule, Calwise spiced rum, fresh lime, and local Root Elixirs ginger beer. 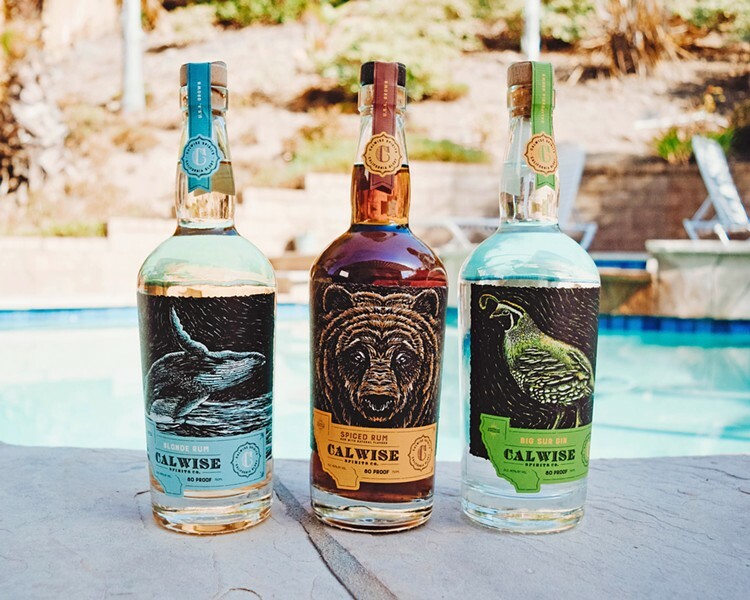 Founded in 2016 by Bergh, one of the youngest master distillers in the world, Calwise Spirits (formerly Calivore Spirits) has reached outside the "locals only" ethos. Across the state, you can find these bottles at Bristol Farms, Whole Foods, BevMo, and Vons, as well as California Fresh Market in San Luis Obispo and Pismo Beach. COCKTAIL HOUR Calwise Spirits, Paso Robles' newest craft micro-distilery, is ready to shake up cocktails and serve small plates. As for restaurants, look for Calwise at Fish Gaucho (Paso Robles), Flour House (San Luis Obispo), Novo (San Luis Obispo), Benchmark Eatery (Santa Barbara), and Boathouse at Hendry's Beach (Santa Barbara). These "liquid California" offerings have earned plenty of praise and awards, too; including a recent win: Best New Western Gin, courtesy of the 2018 California Craft Spirits Competition. But Bergh isn't just about the applause. Some might even say he's more comfortable as an underdog, working behind the scenes. As the story goes, during Prohibition, the feds shut down his family's moonshining operation—but not for long. A century later, the law came knocking again (Cal Poly authorities didn't appreciate the student making hooch in his dorm). Now he's got plenty of room to tinker and grow. Bergh says it feels good to have the 6,000-square-foot facility up and running; he no longer has to share or borrow equipment. 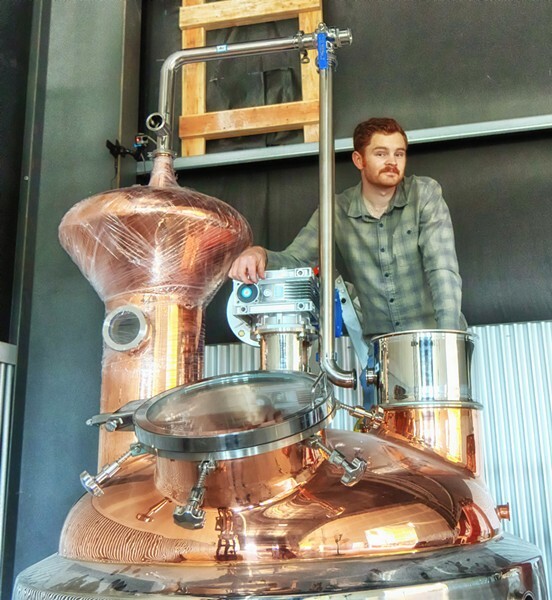 A glittering copper still is the jewel of the new distillery workspace. Customized to Bergh's specific modifications, this baby can handle gin, rum, and whatever crazy thing he throws at it next (an impressive multi-tasker—not unlike the master distiller himself). "This is going to be a testing ground to release new things out into the public; stuff you can't get at BevMo or anywhere else but here," the distiller says. There's already a new barrel-aged gin in the works, plus lots of small-batch mystery projects (liqueurs, brandies) that'll take shape throughout the year. Hayley Thomas Cain wants Calwise Spirits to make a perfume out of its herbaceous Big Sur Gin. She can be reached at hthomas@newtimesslo.com.